Dog lover and animal advocate Katherine Schwarzenegger draws from her own experience with fostering and adopting dogs to create a picture book that introduces children to the concept of “adopt, don’t shop.” In the heartwarming story of Maverick and Me, Maverick is rescued by a kind-hearted stranger after being dumped on the side of the road. The little puppy’s luck takes a turn for the better when young Scarlett meets him at an adoption event. Scarlett is so moved by Maverick’s story that she and her mother decide to give him the forever home he is looking for. Each year, millions of dogs find themselves in shelters and with animal rescues through no fault of their own. Maverick will help teach children about these dogs and empower even young readers to advocate for shelter pups. Maverick and Me is a beautiful children's book for those who have a love for dogs. The story focuses on the need to adopt a dog rather than buy a dog, which is great. 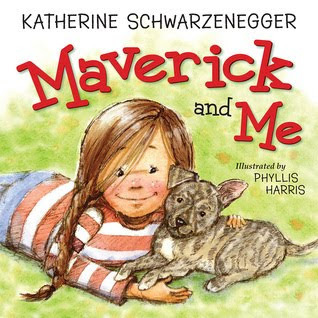 I love how Karen has written the story about Maverick who is a neglected puppy in need of a home and how he is found by a carrying lady who brings him to the pet store. The owner of the store decide to take him home and clean him up. One day, Maverick has the opportunity at his "Forever Home." Will Maverick find it or will he continue to stay unadopted? The only way to find out, is to buy the cute and wonderful book. You'll love the illustrations and the color. This book is gorgeous! The message of this book is incredible and gives a great message to children too about the importance of taking care of pets, but also what it means to adopt a dog too. I give this book 5/5 stars. Thank you to Worthy Publishing for providing me a copy. A favorable review was not required.